Motorists have backed off on their descent speeds, making it easier for bikes to descend with traffic. 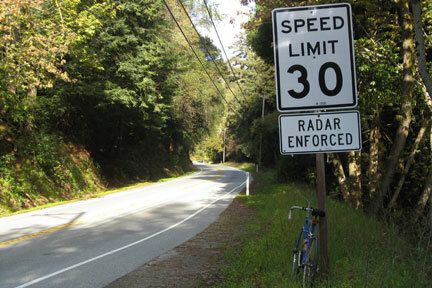 Today on my ride to Big Basin State Park I had my first chance to see what effect the 30 mph speed limit had on traffic. I am pleased to report it had an unexpected beneficial effect on the descent. In the morning on the climb to Skyline, cars whizzed by at their usual 40 mph, on average. I saw few if any cars going 30 mph. When you’ve been riding a bike since the days gas sold for 25 cents a gallon, you become a pretty good judge of speed. On the descent of Hwy 9 to Hwy 236 I needn’t have worried about breaking the speed limit, which is 45 mph on this side. A recumbent could easily break the speed limit here though. I headed down 9 around 12:10 p.m. right about the time 50 million cars arrived at Saratoga Gap and had the same intention of heading down the mountain. I dutifully waited for the rumba line to form ahead, figuring they would blow by me on the way down. What surprised me is that the cars stayed within 5 – 10 mph of the speed limit. I had no difficulty following them down, maxing out at 40 mph. I would have expected a much faster speed, but apparently motorists don’t feel comfortable going 15 – 20 mph over a posted speed limit. It’s bad enough that cars give the Hwy 9 descent a reputation, but when it gets windy here, as it did on Sunday, it’s time to reach for the Diamox. You can bet your trusty oscilloscope my sine wave made a rail to rail waveform that would bring a smile to an engineer. In other words, it was time to shimmy. Jobst Brandt gives his usual engineering explanation as to what causes shimmying, but rest assured understanding how it happens doesn’t make it any less daunting. I took his advice and put both knees on the top tube, as well as taking deep breaths to try to relax. The harder you grip the bars, the worse it gets. It helps to slow down, so I did that too. I’ve never been much of a descender. Jobst and friends amazed me a few years back when they blew by me going 50 down the south side of Conway Summit in a 40 mph sidewind. How do they do it? This entry was posted on April 10, 2011 at 3:27 pm and is filed under News. You can follow any responses to this entry through the RSS 2.0 feed. You can leave a response, or trackback from your own site. >A recumbent could easily break the speed limit here though. Or a fast and heavy roadie. I don’t get going much over 40 on this one. The sharper bends don’t have good visibility for higher speeds. Sure you could go faster. If there’s nothing unexpected on the road you’ll be fine, and your fearlessness will be reinforced. Until, someday your number gets called. On a similar down grade (Spooner Grade into Carson City) I hit the double nickel on a bike for the first time. Weather was stormy and winds gusty. I threw caution to the wind, literally. It was fun, but sometime later after getting blown off the road at 15mph descending from Tioga Pass in similar conditions, I believe I got lucky that day on Spooner Grade. Windy day on Tioga Pass Rd.